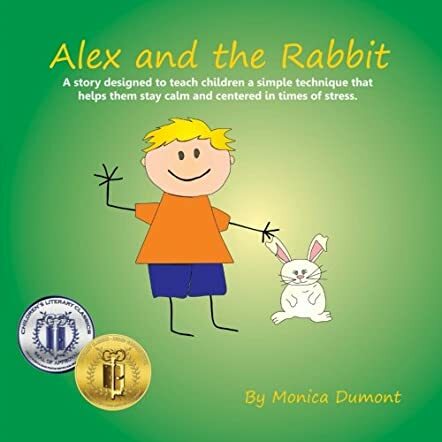 Alex and the Rabbit: A story designed to teach children simple techniques that help them stay calm and centered in times of stress. (Personal Development Series) (Volume 3) by Monica Dumont is one book of four in the author's self-help children's book series. The author provides a very understandable and easy to read text with charming illustrations. Children often get flustered and go into a state of panic when the simplest little thing is off their schedule and it appears to be all wrong. The author helps children relax, remain calm, and think by explaining a simple breathing exorcise. Learning coping mechanisms and techniques at a young age are a crucial part of a child's development. If a child finds a technique that works for them, they often stick to it as well as share it with a friend, as the author portrays the characters in the book doing. Alex takes his bunny outside on a beautiful sunshiny day to play in the grass for the first time. In a moment, the two were separated, as Bunny was distracted and wandered off. Both Alex and Bunny notice they are not near each other anymore, but before either of them became worried, they remembered a trick to stay calm.